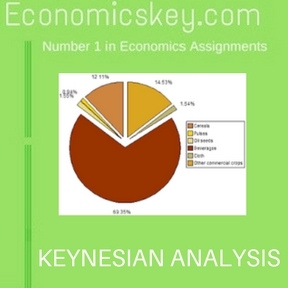 We shall now briefly summarise the Keynesian analysis regarding the relationship between wages and employment as under: (1) In the first place, Keynes agreed with the classical economists that other things being equal, employment varied inversely with the level of real wages. That is, when real wages rose, the volume of employment was curtailed, and vice versa. In other words. the demand for labour depends on the real wage rates: It increases when the real wage rate falls and decreases when the real wages go up. (2) Keynes did not agree that a cut in money wages for the economy as a whole will necessarily cut the real wages. On the other hand. a reduction in the muncy wages reduced proportionately the total outlay, demand and prices so th at the real wages remained the same. Unless real wages are reduced, employment cannot increase. There is no doubt that an individual firm can. by cutting money wages. reduce costs and thus increase sales and employment. But when a general wage-cut is throughout the economy, demand schedule will register a fall throughout, because all worker find their purchasing power re- 14 rate.per cent duced.